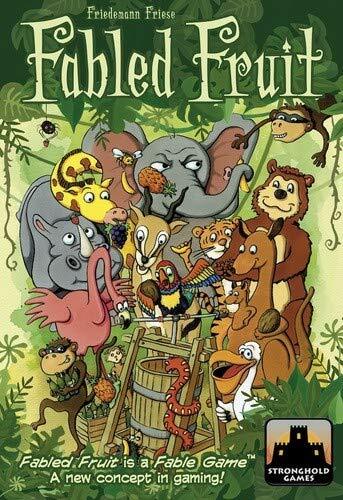 At any time you may easily restart a Fable game from the beginning, either after you have run through the entire game system, or at any time during the multiple plays you will get from this game system. The Fable game will remain just as playable on the 20th play as it was on the first play of the game. Once upon a time there was a marvelous forest full of gorgeous fruits. These fruits came in vivid colors with the sweetest tastes. And the best part was the fruits could be squeezed and mixed into the most delicious juices. You are animals living in this forest, searching for the most savory fruits. You find them with the help of friendly forest-dwellers. They give you fruits, trade them with you or help you in other ways. It is most advantageous to be the first at these locations. If you are already at a location, you get a fruit from the animals arriving after you. You are greedy and thirsty. Who will be the first to satisfy their appetite for fabled juices? 1 Open the 4 big card packs with the location cards. We will now call them locations. DO NOT SHUFFLE THESE LOCATIONS! All packs are presorted, so you only need to place the huge locations stack in the center of the table, with location #1 visible on top and #59 on the bottom. 2 Draw all cards of locations #1 - #6 and place them in separate stacks next to the location stack. Each of these small stacks contains 4 cards all with the same location number. 3 Shuffle all 60 fruit cards. We will now call them fruits. Deal 2 cards to each player, which they take into their hands. Place the remaining fruits in a face down fruit stack next to the huge locations stack. You will need some space for a discard pile. 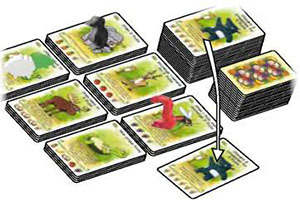 4 All players choose an animal piece along with its matching cardboard token. The game comes with 6 different animals, so you should have the opportunity to find your favorite animal! 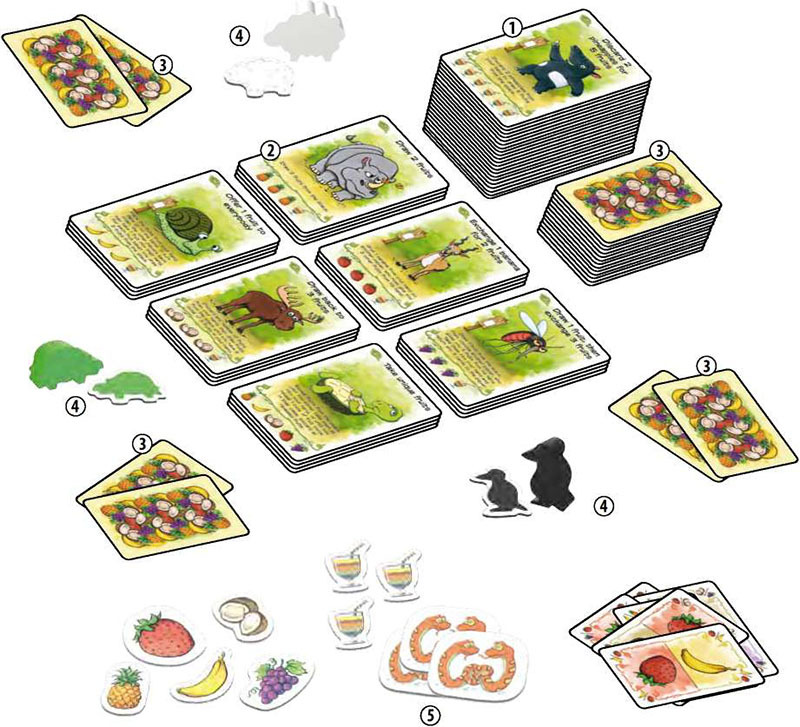 5 Place all remaining game components for the moment to the side: the thief, the 5 fruit tokens, the 3 double turn tokens, the 3 wild tokens and the 10 fruit-mix cards. They are all not used during the first game. You will play with them in later games, as new locations will show up. The glossary explains all the different locations. 6 Choose a start player, who selects one of the remaining animals which will now be used to mark him as start player for the game. You are now ready to start playing! You take turns in a clockwise direction. Each turn you must move your animal to a new location and use its action to collect fruits. If you have enough fruits in your hand, instead of using the action of a location you can buy it as one of the fabled juices. The player with the most fabled juices, when the game ends, will win the game. On your turn, you must first move your animal to a new location. Place your animal on any available location. If one or more of the other players are already located on the new location, you must give 1 fruit of your choice from your hand face down to each of them, which they take into their hands. If you do not have enough fruits in your hand for all players, you must give away all your remaining fruits but choose the players who will each receive a fruit. If you do not have any fruits left in your hand, you can move to any new location occupied by other players without giving them fruits. Example: In her first turn, Anne placed her sheep on location#5. Now, she moves to location #4. Paul's turtle already stands there, so Anne must give 1 fruit from her hand to Paul. After moving, you use the action as explained in the text box and title of the location. To start your first game, only read the rules of the actions for the 6 available locations on the front page of the glossary. All these actions help you to collect a lot of fruits. There is no hand limit, so you can collect any number of fruits. Example: On location #1, Rachel draws 2 fruits from the stack. If you have the required fruits in your hand, you can buy one of the fabled juices. When moving to a new location, instead of using its action you can buy the available fabled juice. You must pay the fruits as shown on the bottom line of the location. In addition to the 5 types of fruits, you may find smoothies as part of the price. These smoothies are wild, so for each single smoothie, you can pay with any type of fruit. A few cards have special prices. 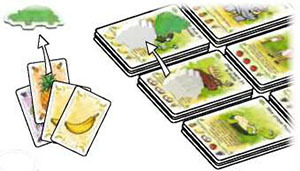 To pay the price, you discard the required fruits from your hand, and take a location card from its small stack. Place it face down in front of you, so it shows the bottle filled with the fabled juice. Example: On location #3, Camille decides to buy the fabled juice. She pays 3 grapes and 1 banana (her fruit of choice for the smoothie). Then, she takes the topmost location from that stack and places it face down in front of herself as her first fabled juice. Whenever you buy a fabled juice, draw the topmost single location card from the huge locations stack. If it is the first card of a new location, begin a new small location stack for this location number. Otherwise, place it on top of the matching small location stack. Every 4 cards of the huge locations stack are incrementally grouped as sets of the same location. Each time a location card with a new forest-dweller enters the game, all players can now use this new action and/or buy this new fabled juice. If you buy the last (fourth) fabled juice of a small location stack, that stack is now depleted and the matching action is no longer available. If your animal stands on that depleted location stack, take it back in front of you and during your next turn move it again to a new location. Example: Afterwards, Camille immediately draws a new location card from the huge locations stack. Since this is the first location #7, she begins a new small stack for that location. To win the game you need to buy a certain number of fabled juices. 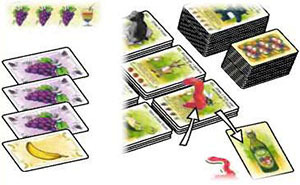 As soon as the first player has the required number of fabled juices, you finish the current round, so all players have the same number of turns. The player to the right of the start player receives the last turn. The player with the most fabled juices wins the game. 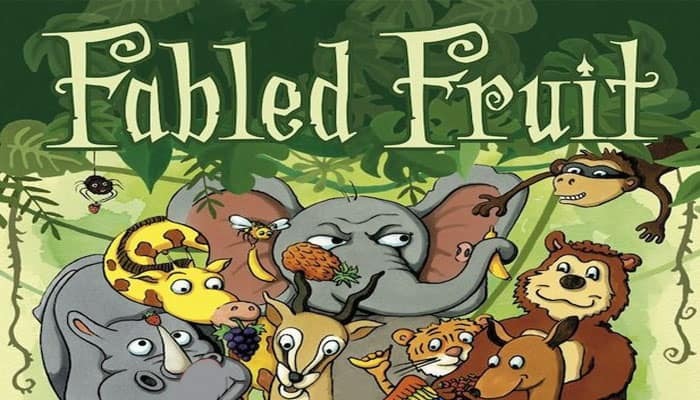 In case of a tie, the tied player with more remaining fruits in his hand wins the game. If there is still a tie, these tied players share the victory! After determining the winner, place all purchased fabled juices back into the game box. DO NOT SORT THEM BACK ON TOP OF THE HUGE LOCATIONS STACK! We supply several plastic bags with the game, so simply place the fabled juices in one of the bags. You will start your next game with the 24 location cards, which are currently lying in separate small stacks on the table! Usually, you will now have more than 6 small location stacks. The loser of the previous game is the new start player and chooses one of the unused animal tokens as the new start player token. 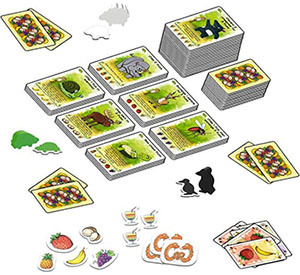 Shuffle all fruits and again deal 2 fruits to each player. Check the available locations, and ensure you have all required additional game components which may be identified on these cards. You are now ready to play again! If you want to play again on another occasion, simply place the 24 location cards on display in order on top of the huge locations stack, so you will draw them again when preparing the next game. Again, use the supplied plastic bags to secure that stack, so the cards do not accidentally get mixed up. If you want to play your next game with a different set of players, use the table on the back of the glossary to track the current 24 location cards, so you can later continue to play with the previous set of players. The winner(s) of a game get 2 victory points, the last player(s) get 0 victory points. All other players receive 1 victory point. Write these scores on a pad of paper and start a new game. The player with most victory points at the end of the game session is the overall champion!